At this point, I would like to reveal that one of my favorite and most publicly unknown hobbies is that I enjoy cliffdiving. I didn't say "cliffjumping"... I meant cliffdiving. Pay special attention to the difference: I am crazy enough to dive head first into waters that may be 30-50 feet below the launching point. Whilst you wonder what would drive a person to do something like this, I want to explain to you why I believe it is a wonderful analogy for the concept of vulnerability. Whenever you take a group out to cliffdive, you see much of the same human behavior: outside of a few individuals who just "go for it," most people hesitate for quite a while at the edge of the cliff. Whether it is the realization that there is significant danger involved or they just have never done anything involving as much adrenaline or courage, hesitation is usually a natural reaction. In fact, I have seen people hesitate at the edge for upwards of 15 minutes as they consider taking the leap. No matter how much others try to help with really slow countdowns from 10 to "jump," it takes quite a bit of courage to push yourself over the edge. But eventually, most people go for it. Fact: I have seen people get hurt! I am not talking about anything similar to a Kevin Ware-type injury, but that slight hesitation before they take the running leap can cause either a number of scrapes along the way as they slide across the rockface or hitting the water at an angle that is not preferable (i.e. a bellysmacker). Plus, there is a chance that a bad experience can have a lasting impact on a person (although this is not very frequent). 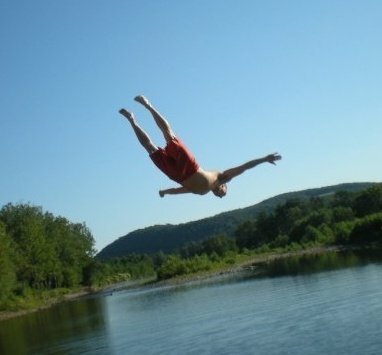 Fact: Most people who go out to cliffdive, (when they gather enough courage to jump) have a great time! Even if they just do a normal pencil dive, the adrenaline rush that they get when they hit the water safely is unbelievable. There are tons of smiles, laughs, and memories made each and every time they head to the lake/river/pond/ocean. Photos are taken and detailed videos encapsulate the moment perfectly.